Children possess an absorbent mind, taking in everything from their environment through listening, observing and imitating. Children have the ability to teach themselves. The classroom is designed to provide a beautiful, safe environment that is rich with language and appeals to the senses of the child. The teacher observes the physical, emotional and intellectual needs of your child and matches lessons and experiences accordingly. 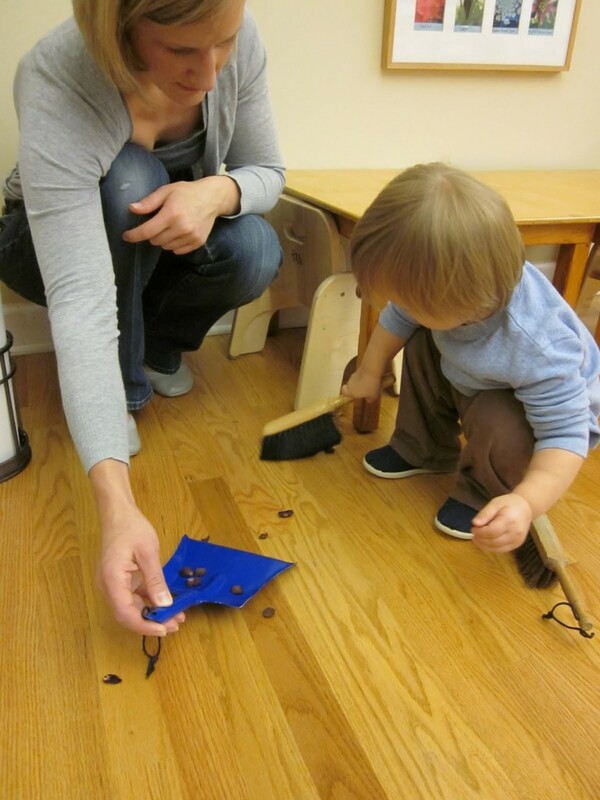 The Parent/Infant Community is an introduction to the Montessori method for children and parents. The program fosters the child’s development through exploration of thoughtfully designed materials, aiding and refining the child’s language, motor, social-emotional and cognitive growth. Being in Community and engaging in materials and activities such as puzzles, preparing food, and hand-washing, helps the child foster skills in independence, coordination and confidence. The parent’s role in the class is to observe, support and encourage the natural development of the child, with the guidance of the teacher in a supportive and nurturing environment. Monthly parent education meetings are offered throughout the school year as a chance for parents to enrich their knowledge of child development, Montessori philosophy and gain practical parenting tips and guidance. For more information, review the Parent/Infant FAQ. The Toddler Community is a bridge between home and school. The classroom is considered an extension of the home, providing a nurturing environment with a variety of Montessori materials and activities to promote the child’s language, motor, social-emotional and cognitive development. Children develop greater independence and confidence through working and exploring with materials and activities such as preparing food, creating artwork, learning to use the toilet, washing tables, sorting shapes and much more. The curriculum is designed to strengthen the child’s small and large motor coordination, refine the senses, expand vocabulary and help the child learn to work alongside peers in a nurturing and supportive community. Monthly parent education meetings are offered throughout the school year for parents to enrich their knowledge of child development, Montessori philosophy as well as gain practical parenting tips and guidance. For more information, review the Toddler Community FAQ. manipulatives which refine the senses and develop an understanding of early mathematical concepts through hands on exploration. 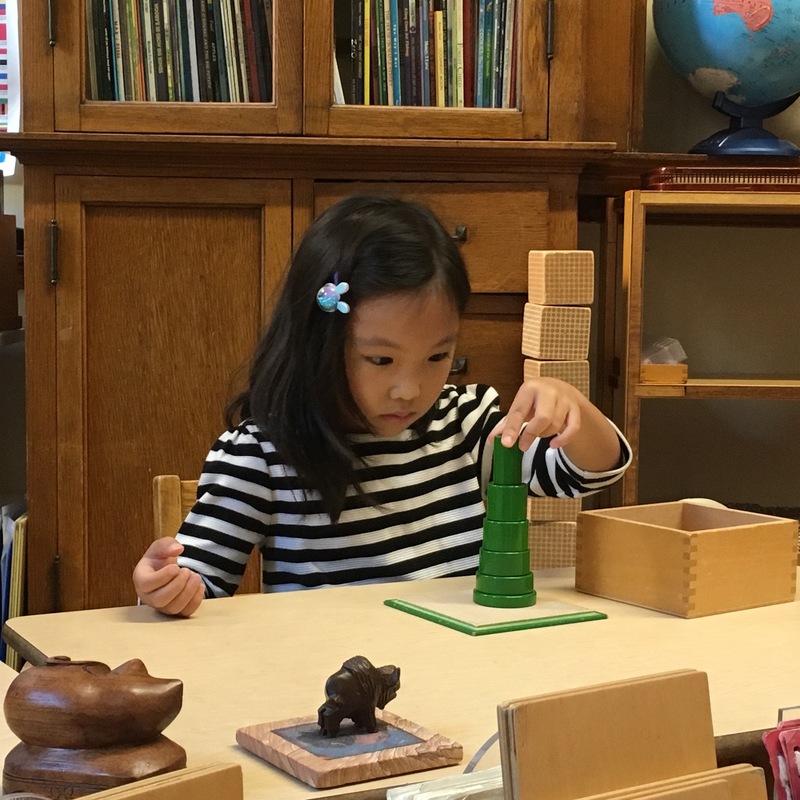 Math: A variety of Montessori materials are sequentially introduced to develop the child’s understanding of numbers, patterns, and operations, slowly moving from a concrete exploration of quantity to an abstract understanding of numbers. Language: Montessori materials promote a multi-sensory learning of the phonetic alphabet. Children move through a progression of materials to develop their skills in phonetics, writing, pre-reading, and reading skills. Cultural Studies: A variety of cultural subjects such as geography, history, sciences, art and music are offered through the Montessori materials as well as through their own explorations and creative expression. The Spanish language is also an organic part of the curriculum as each classroom is assisted by at least one Spanish speaking adult. Monthly parent education meetings are offered throughout the school year as a chance for parents to enrich their knowledge of Montessori philosophy, child development and gain practical parenting tips and guidance. For more information, review the 3 to 6 FAQ.